Welcome to the "Official" 2019 Mickey's Not-So-Scary Halloween Party Thread, where you will get THE most updated information for all of your Halloween needs! Most of this information is from last year's party. However, I will update the thread as new information is released. What are the dates for the 2019 MNSSHP? When do MNSSHP Tickets go on sale? At the earliest time ever, 2019 Mickey’s Not So Scary Halloween Party Tickets are now on sale (1/15/19)! Disney Parks Blog announced MNSSHP Dates and that tickets were on sale. This year, Mickey’s Not-So-Scary Halloween Party will transform Magic Kingdom Park into a spook-tacular celebration for a total of 36 nights! That’s right, two additional nights added to the event, extending it to Nov. 1. 34 Parties for 2018. 32 Parties for 2017. 29 in 2016. Please note that MNSSHP is a "hard-ticket" event. A "hard-ticket" event means you must buy a separate ticket for admission to the party, you cannot use a day of your regular Magic Your Way ticket to attend MNSSHP. Ticket prices vary depending on the date of the party. *These are the only nights that are discounted for the military, if you plan on attending one of the other nights it will be at full price. Prices obtained from Shades of Green, Disney ticket window prices could vary slightly and we’ll update as needed once intel rolls in. *Active and Retired U.S. Military, including members of the U.S. Coast Guard and participating members of the National Guard and Reserve, may purchase discounted Mickey’s Not So Scary Halloween Party Tickets for special military priced event nights. They may also purchase additional tickets for up to five (5) family members and/or friends. Tickets can be ordered by calling 407-W-DISNEY or purchase online, https://disneyworld.disney.go.com/tickets/events/. Once you purchase tickets, they will be linked to your My Disney Experience account (MDE). What time does MNSSHP start? What time can I enter the park? 2018 - MNSSHP officially starts at 7pm, with park closing at 6pm for day guests this year. Guests may enter Magic Kingdom using their party tickets starting at 4pm. This practice is not officially advertised by Disney, but it has been exercised for many years and Cast Members will readily confirm this information. None of the party-specific M&Gs or trick-or-treating will begin until 7pm, with a few M&G exceptions. In 2018, Members and their guests can enter Magic Kingdom park 2 hours earlier than ever before—as early as 2:00 PM. Simply present your valid Disney Vacation Club Membership Card and your event ticket at the main entrance touch points to take advantage of this benefit. MNSSHP Ticket Holders have purchased tickets with "their money" for the party; if you do not have a ticket/wristband make your way to exit the gates by 7pm. As discussed on another thread, there are different color wristbands, so NO Double Dipping to attend another party. Oh, my! I'm already in the park. Do I have to exit and re-enter for MNSSHP? No, there are checkpoints within the park to check-in and receive wristbands for MNSSHP! WhenCan I Make FP+ Reservations? http://www.disboards.com/threads/everything-sdfp-second-set-fp-long-faq.3520747/ (Thread name changed toSDFP: CHANGES COMING!! Beware the 6th of June!, as of May 2017.) ---It has been determined it violates Disney's Terms of Service for MDE. Mickey's Not-So-Scary Halloween Party Map gives you an idea of special foods available, as well as show times for the major entertainment. Where can I Trick-or-Treat" in the Magic Kingdom? What characters can I meet at MNSSHP? It depends. There are a few of the popular characters that will have lines that begin long before the party starts. If you want to see the 7 Dwarfs or Captain Jack Sparrow you will want to line up around 5:00pm. The other M&G wait times will range from 30-45 minutes. 2018: Jack & Sally reported as meeting at 4pm, received wristbands in line, M&G in Town Square Theater (Changed after several parties had occurred). 2017: Jack & Sally reported as meeting at 5pm, Moana @ 5:45pm and the 7D at 6:15pm. M&G lines appear to be even longer this year, especially the new Moana M&G. Can I purchase Memory Maker for MNSSHP ONLY? The Memory Maker Window begins at 6am EST on the day you use the 1D theme park admission with which MM is bundled at purchase or if MM was purchased separately, the date the photo selected on the MDE app, or of applicable, on MyDisneyPhotoPass.com when purchasing MM or when linking a previously purchased MM code to your Disney account and ends at 5:59am EST on the following day. (i.e. The 1D Memory Maker can be purchased in the app, after you have a photo loaded into your account, click on the photo, and you will get the option to purchase either the 30-day MM for $169, or the 1-day MM for $69). Are the attractions open during MNSSHP? Yes, and the lines for most attractions (except Seven Dwarfs Mine Train) will have much shorter wait times than a regular park day. Please note that typically the Jungle Cruise is closed for MNSSHP. What are the times for Mickey's Boo-to-You Halloween Parade? Boo-To-You runs at 9:15pm and 11:15pm (2018). It has been discussed that the second parade is less crowded than the first. There are advantages and disadvantages to both depending on your party size/age and party plans. Not sure about crowd levels for either parade with the time change of the first parade (2017 & 2018). What time is Happy HalloWishes (Fireworks)? These treats will only be available within the Magic Kingdom during MNSSHP. MNSSHP is a special ticket event with a limited amount of tickets sold. It has been discussed that more tickets are being sold as of late. However, due to Party Entertainment, crowds tend to be more concentrated around the events, especially the parade and fireworks. Also, parties are typically busier the closer to Halloween and on Halloween night. If you can attend one in early to mid-September you will find it less crowded than one in late October. Day of the week tends to matter as well, with Monday through Thursday evenings being less busy than the weekend events. Please note that the party will go on regardless of weather, so even if it's pouring down raining, it will take place. Please note 2016 & 2017 did have weather closers (See 2016 & 2017 Official MNSSHP Threads). Due to Florida weather, ensure that your costume/party attire is cool enough to wear in the heat and humidity and something that can easily be covered in a poncho. It's a Halloween Party! Do people dress up? This is subjective, and you will see conflicting opinions posted on various threads. Remember - you can enter the park at 4pm if you have purchased a MNSSHP ticket. If you want to you can make an ADR starting from 4pm and on. Most agree that you should eat either before, or during the 4-7pm time periods so you DO NOT waste time/miss the Halloween Festivities. Yes, you can make your reservations up until ~6pm (Please check the Dining Page of the Restaurant in Question. Times verify depending on the Restaurants.). Please note you will be asked to leave the property as soon as your dining experience is complete. If you have not purchased a MNSSHP ticket, you can purchase a same day ticket IF the party has not sold out. At Mickey’s Not-So-Scary Halloween Party, 3 of the most popular table-service restaurants in Magic Kingdom park will be open. Dining reservations are available from 6:00 PM to 11:00 PM. Please check the MNSSHP Dining Page for Specific Times of Each Restaurant. Mickey’s Not-So-Scary Halloween Party tickets are required to book dinner or dessert party reservations. No exceptions will be made. Valid tickets to Mickey’s Not-So-Scary Halloween Party are required to make reservations and are not included in the price of dining or dessert party packages. Yes, there is a dessert party! The Happy HalloWishes Dessert Premium Package costs $84 for adults and $50 for children (ages 3 to 9) plus tax. A separate Mickey's Not-So-Scary Halloween Party ticket is also required and is not included in the price of the package. Call (407) 939-3463 to reserve your premium package or book online, https://disneyworld.disney.go.com/d...fireworks-dessert-party-tomorrowland-terrace/. Offering an indulgent, bewitching buffet featuring swoon-worthy sweets and sips—including chocolate-dipped strawberries, cupcakes, ice cream, seasonal fruits, cheeses and other ghoulish goodies created daily by our master pastry chef. Sparkling cider, signature lemonades, coffee, tea and hot chocolate will also be served. Top off this delectable event with sweeping views of the Halloween fireworks spectacular over Cinderella Castle for a stunning display of color, music and light you’ll never forget! Guests will receive identification credentials upon check-in at Tomorrowland Terrace and must present them for entry to the dessert party. This dessert party is only offered on select dates during Mickey’s Not-So-Scary Halloween Party. Advanced reservations are highly recommended. Valid admission ticket for Mickey’s Not-So-Scary Halloween Party is required and not included in the price. The dessert party will operate rain or shine, even if the fireworks are canceled. How to Book: Call (407) 939-1872 to reserve your premium dessert party package or online @ https://disneyworld.disney.go.com/dining/magic-kingdom/mickeys-not-so-scary-fireworks-dessert-party/. Note: Valid theme park admission and Mickey’s Not-So-Scary Halloween Party tickets are required and are not included in package cost. 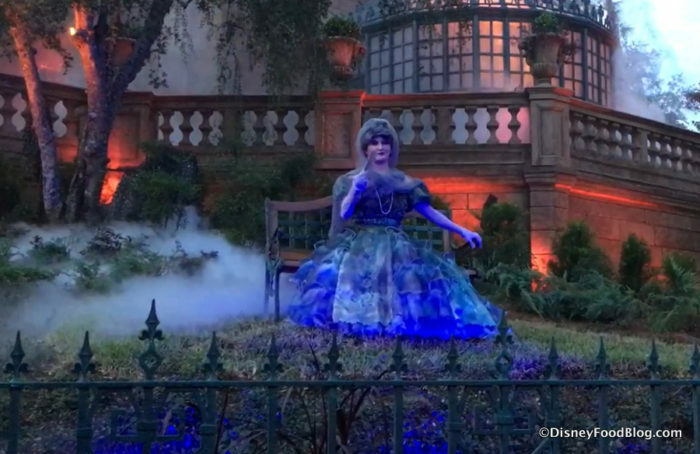 Madame Carlotta typically sits on the lawn of the Haunted Mansion entertaining guests in line. Guests are given Trick-or-Treat Bags upon entry into the party. Trick-or-Treat Bags can be used at the candy stations found throughout the Magic Kingdom. Locations are indicated on the map. See your favorite characters dressed up in their Halloween costumes, beloved Disney Characters and Disney Villains! Headless Horseman Times: 9:05pm & 11:05pm; These are the Times He steps Out From Frontierland, 10 minutes before the parade start time. The Headless Horseman will not ride if it rains or if it's too slippery. Zootopia Party Patrol (Nick Wilde and Judy Hopps) Pre-Show: Nick Wilde and Judy Hopps from Zootopia are joined by a group of dancers for a pre-parade party patrol. The Haunted Mansion's Ghost Host welcomes guests to the show where the Disney Villains fill the sky with fireworks and remixes of their theme songs. A party in the sky! The Sanderson Sisters from Disney's film Hocus Pocus, return to the mortal world each Halloween season for 1 night. The sisters take over the Magic Kingdom to throw an evil Halloween Party. The show feature dancers, projections and other special effects. Venture into Frontierland and you just might encounter the ghostly group known as the Cadaver Dans. They really like "axing" Guests questions… and answering with puns as part of their "dead pan" humor! So gather ‘round for the haunting melodies and razor-sharp wit of this barbarous-shop quartet. Dare to scare this Halloween as you kick up your feet with Mike, Sulley and other favorite friends from Monstropolis. Featuring the stars from the Disney·Pixar films Monsters, Inc. and Monsters University. A dance party featuring some of your favorite Disney Junior Characters, including Doc McStuffins! Join Doc McStuffins, Vampirina (Starting September 9th, Seen @ 9/7/18 Party), Timon and Mickey for a high-energy musical celebration. The Frontierland Costume Promenade makes its debut in 2018! Prospector Cactus-Flower Cate will round up young guests and encourage them to show off their costumes in a quest for candy. Alaskangirl02, samsteele, sherlockmiles and 5 others like this. At the earliest time ever, 2019 Mickey’s Not So Scary Halloween Party Tickets are now on sale! You can find all the potential dates right here! The parties will begin on August 16, 2019 and run through November 1, 2019. The pricing of the tickets will vary from $79 up to a whopping $135 for Halloween night. Kids tickets start at $74 and go to $130. Cluelyss, Momma_Lanier and neverenoughtime like this. Can you still get in with party tickets at 4pm? Well the first thing I saw at 6am when I woke up was posting about this year's party tickets on sale! Like everyone else, that was a bit of a shocker. So what did I do? Purchased tickets for 8/27 and 8/30. Buying tickets 7 months early is pretty crazy, but when it comes to my Disney vacations, I'm definitely crazy. I already had those dates in my plan anyway. Mrspeaks, sherlockmiles, PolyRob and 1 other person like this. Well it might be absolute madness but I bought tickets to the first party. It's a special date for our family, so even though it's going to be crazy crowded we want to be there. Current plan is to do another party in hopes of actually seeing things, LOL. First party of the year veterans, what's a reasonable 'to do' list? We don't do character photos except for the grave diggers and Madam Carlotta. Priorities are magic shots, rides, Cadaver Dans, and the parade. How much of that is 'do-able'? Eeks!! I was shocked that MNSSHP tickets were on sale this early! We’re going 9/5-9/13. Now, I just need to decide whether to go on the 8th or 10th! My son is no longer free since he will be 3 before our trip. Total cost is $404 which is pretty expensive but this was a highlight of our trip last year so of course, we will let Disney take our money! First party veterans, what's a reasonable 'to do' list? We don't do character photos except for the grave diggers and Madam Carlotta. Priorities are magic shots, rides, Cadaver Dans, and the parade. How much of that is 'do-able'? Last year was our first party. With my kids, we were able to ride rides, do a couple magic shots, ToT a lot, meet the grave diggers, see Cadaver Dans, meet Moana, watch both parades and see fireworks. If you have a good plan, you can accomplish a lot of what you want to do. I'm so excited...maybe! It's my 40th in August, so now I'm looking at an end of August trip. But....I HATE THE HEAT!!!!!!!!!! It would be SO fun to go for a couple of days, enjoy whatever pool, and head to a Halloween party at night. What to do?????????? sherlockmiles and Momma_Lanier like this. It’s your 40th!! BOOK IT! sherlockmiles and JJ2017 like this. Boo to you and you and you and you... Happy Halloween. Karalee402, sherlockmiles, disneydreamer781 and 8 others like this. Totally surprised by the early announcement, but I am Disney crazy and we will be attending the party on Sept 6th! It's the night before we leave for our first every Disney Cruise! This vacation is going to be amazing. Now I really need to start working on costume planning!